The magic system in an role-playing game is always an important part, closely integrated with all areas of gameplay. Too simple, too complex, too weak, too powerful… it’s not an easy to task to get right. While balancing is still way down the road and all numbers can change, here’s a glimpse of how magic is designed in DarkDale. First of all, the main model adopted will be that of the so-called “spell-book magic”, as opposed to variants of runic magic (Dungeon Master, Legend of Grimrock, Ultima Underworld). Spells will thus be learnt and written in a spell-book, from where then can be subsequently be cast multiple times. In a classic way (Eye of the Beholder, Baldur’s Gate), spells will come in the form of scrolls, that you can either use to cast the spell or inscribe it in the spellbook, consuming the item. This system gives verstility to scrolls, as buying or finding additional ones even if you already know the spell is not worthless, as they can be used at no mana cost, for these though moments. Once learnt, spells can be cast for as long as the caster has mana available, so no Vancian “memorizing” mechanics. Casting spells only depletes mana, as opposed to physical attacks which borrow from stamina (champions in DarkDale have three stats: health, stamina and mana). However, an exhausted mage is no good, and a character will be unable to cast spells if its stamina is below 10%. As spell casting is done through a separate icon on the character panel, the champion hands are free to hold other objects, such as weapons. This stamina requirement is there to keep in check spell-casting and fighting at the same time. If you hack and slash too much with a heavy sword, you might find yourself too exhausted to concentrate on a fireball afterwards! Note that in any case, all champion’s actions will be unavailable until the end of the cooldown period whether you attack or cast a spell. Each character will be able to define 3 quick-spells that are readily accessible from the character panel when you need something magical fast. You can of course always cast any spell by opening the spell-book panel and selecting the appropriate spell from there. 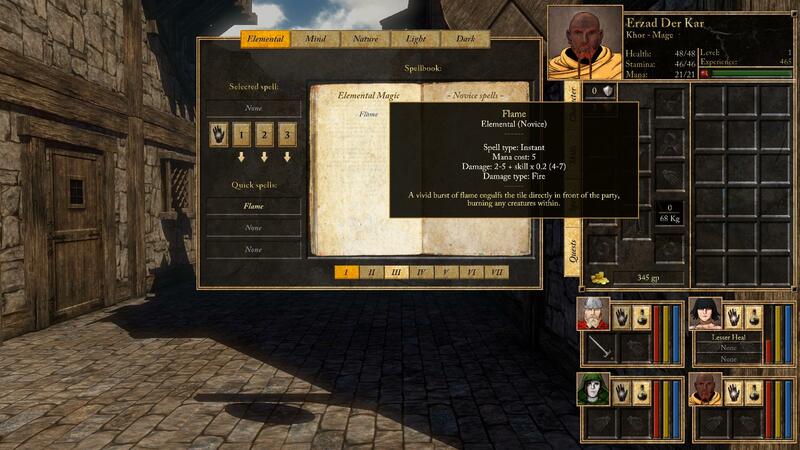 A screenshot showing the spell book panel, and, in the lower right, a character ready to cast a quick spell. Elemental Magic encompasses all offensive and defensive spells from the elemental domains of fire, ice and lightning. Firestorm, Frost Shield, Lightning Bolt… The tried and true toolbox of adventurers lost in deep dungeons. Mind Magic is the realm of thought and illusions. Cause or Remove Fear, Mind Blast, Mind Control, Persuasion, Courage: examples of the power a mind mage can wield over others, be it friends or foes. Nature Magic commands over the forces of nature and its inhabitants. Through Whirlwind, Earthquake, Calm Animal, Cause or Remove Poison, Petrify, Create Food… nature magic can be as deadly as it can be generous. Light Magic is woven in purity and bright power and it is also the school of enchantment. Light weavers control most healing spells, but also spells such as Protection from Magic, Cause or Remove Blindness, Repel Undead or Enchant Armor. Dark Magic deals mainly with death and demonic powers. It can summon undead to fight for the party, Cause Weakness, Death Cloud, Darkness, Demonic Strength: powerful spells – which usually come with a price. Blackfire (Elemental/Dark): an unholy magic flame that burns even creatures resistant to normal fire. Ice Wind (Elemental/Nature): a freezing wind strikes the creatures in front of the party, inflicting cold damage and pushing them away. Purify (Mind/Light): a spell that cures all conditions affecting the body and soul of a creature. Touch of the Deathfang (Nature/Dark): the next creature the caster strikes is inflicted with a dark poison that can outright kill weak opponents. Raise Dead (Light/Dark): only one who wields the powers of healing and has control over the realm of the dead can bring back a fallen champion to life. In part two of this article we’ll examine how this magic schools reflect upon the seven character classes, to give you an idea of the actual choices you’ll have to make when building a party. Meanwhile, we’d also like to announce that we’ve opened the forums on darkdale.net! So if you have any thoughts to share concerning how the game development is shaping up, you’re welcome to click the link in the top right of the page and register. This looks better with each update. Really looking forward to playing this game. I have one question, not game related though, is it possible to change the background on the website?. The black background and light writing is difficult to read. Thanks for the comment, and suggestion. I made the background a bit lighter, the contrast with the text more pronounced, and the font size larger. I hope it helps! Huge improvement, for my ancient eyes. Thanks. Hi Georges. Your game takes shape and it really looks awesome. By the way, I have registered to the forums a couple of days ago, but haven’t received an activation email yet. Can you see it, because I cannot find any administrator’s email (as suggested in the forums, in case of problems), to contact! You should make it available somewhere I think. You can delete this post, after, as it is merely made for solving the activation problem. I have years of experience with wordpress, blogs & “normal” websites, but I’m new to forums and phBB, the software that powers them. I’ll fix issues as they come, thank you for the feedback. I’ll investigate the issue, meanwhile I activated your account and removed the e-mail activation requirement until I find out what wasn’t working.